The first step is to mutagenise a population of organisms, or cells or similar. Mutagenesis is basically causing damage to DNA. Lot’s of things can do this, Wikipedia has a great page on mutagens. In plant genetics, the mutagen we typically use for changing single nucleotides in DNA, things we call point mutations or Single Nucleotide Polymorphisms (SNPs), is EMS - Ethyl methanesulfonate. EMS will predominantly make C’s change to T’s and G’s change to A’s. These mutations are distributed fairly uniformly throughout the genome. In practice we take a load of plant seeds and soak them in a solution of EMS. The EMS soaks in and damages the plant’s DNA. This damages the DNA in some but not all of the cells in the seed. We grow up the seed (let’s call the plants that grow up the M1 generation) and the cells in those M1 plants that descended from the mutagenised cells carry the mutations. Sometimes these will be cells in the germline - ones that beget seeds. 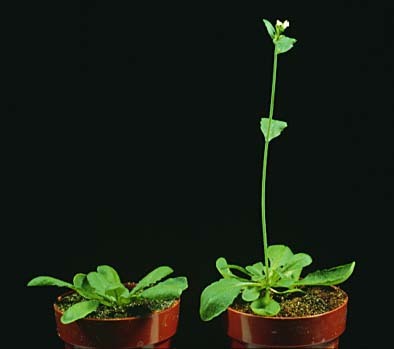 The progeny of the M1 plants, that grow from mutation carrying seeds (let’s call these progeny the M2) will all grow up with the mutation in every cell and eventually, by identifying the progeny plants carefully, we can get a population of plants which are homozygous for all the EMS SNP mutations we induced. Once we have a mutagenised population we can start to select the individuals in that population that show some change in the phenotype of interest, say flowering time. We can use further crosses to bring in extra variation or use the natural variation - both of which are heterozygous - while keeping the homozygous mutation(s) that is (are) causing the phenotype by constantly selecting for offspring that show the phenotype of interest everytime we carry out crosses. 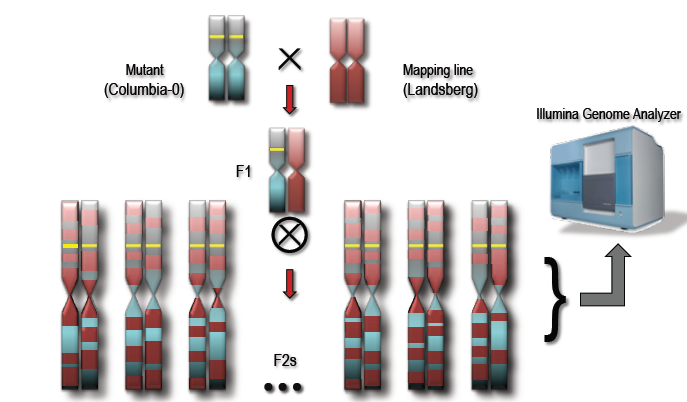 All these crosses cause recombination in the chromosomes that bring in homologous parts from the line being used to cross. This happens at a greater frequency away from the mutation that we are selecting for such that regions further from the selected mutation carry fewer and fewer of the homozygous mutations. This statistical difference, a region of high homozygous SNPs around the mutation is what we will use to identify the SNPs that cause our phenotype of interest. What is the SNP type at position X? What is the SNP type at position Z? In a mutagenesis, after crosses, why are we concerned with homozygous SNPS? They are the SNPs we induced with mutagens and carefully selected for with crosses. They are the general ‘background’ SNPs, so are a good control. Homozygous SNPs ALWAYS cause a phenotypic effect. Homozygous SNPs are easier to detect. Imagine you work on an organism with a single chromosome and that you have just put it through a mutagenesis and series of crosses. Draw the distribution of homozygous and heterozygous SNPs you would expect around a causative mutation.